Note: Amazon.com are selling this book at 32% discount. Click here for Rupert Loydell's review of Prelude, Interlude and Postlude. 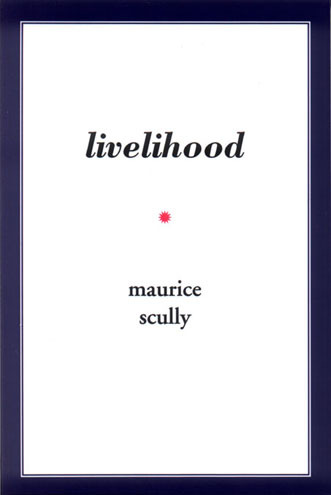 Maurice Scully was born in Dublin in 1952 and educated at Trinity College, Dublin. He has been editor of a number of influential magazines and chapbook series, and through the 1970s and 1980s organised readings and literary events. Among his books are Love Poems & Others, Five Freedoms of Movement and the recently completed Sonata.. Several sections of the present volume appeared through the 1990s as separate books from Pig Press, Writers Forum and Reality Street Editions. Similarly, several chapbooks of work in progress appeared through the 1990s from Staple Diet, Poetical Histories, Tel-let, Form Books and Wild Honey Press. What is the Cat Looking At?, a children's book in collaboration with the artist Bianca Grünwald-Game, appeared in 1995. "Absolutely authentic . . . Every episode of explanation collapses into peace and war, phonemes like bullets ricocheting off the present tense. Pain, disregard and distance chop the continuum to bits and the bits roll around the wasted fields of Ireland and Africa chiming together into a brilliant suspended hope, which is where we really are." what is the name of the sound of the rain? in a sort of constricting ring. the other. thing. in time. into another . . .
Daybreak: patter of feet to bathroom and back. in the garden. We go out for a walk my kids and I.
and pockets in the head.) Life, bright and brief ! machine where jets make landfall and go on. My children. children fly. Fragrance rises. Stem wavers. one pollen-grain, one, the fruit's flesh swells. Delicious! Yellow, the daystar; green is begin.